Woodland Scenics Hot Wire Foam Cutter ST1435. Woodland Scenics SubTerrain Hot Wire Foam Cutter. INCLUDES: One Hot Wire Foam Cutter. FEATURES: Adjustable collars allows for clean, accurate cuts in foam. Nicely detailed 1/87 HO scale model for an HO layout, or as a stand alone collectible model. • Scale 1:87 HO. • Highly detailed with "see-through" roof & four latch bar. • Set of two trailers w/different numbers. Walthers SceneMaster 1/87 HO (2) Schneider National 53' Stoughton #949-2453, highly detailed, in service from the 1990s to the present, highly detailed with see through roof, sliding undercarriage wheels ,see complete details below. Life-Like #1377 HO Scale Build-A-Scene Moped Dealer - Realistic Scenery & Building Kit includes complete landscape materials, building and detail parts. 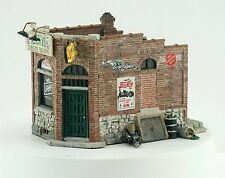 Build-A-Scene Moped Dealer. Life-Like #1377. - Everything you need to build a compete and realist. AUTUMN/FALL DECIDUOUS TREES 3" HIGH - WITH WIDE TRUNKS. HO,N,SCALE. MIX LOT OF 6. This could be used for N,Nn3 Scale, HOn30,HO Scale and other scale Trees. BEFORE BENDING~DO IT YOURSELF. Ready for you to paint, bend to your liking & install your favorite color foliage to build your dream trees. Henry's Haulin' - HO Scale. Capture the classic designs and simple lifestyles of the 1940s and '50s. The wooden sideboard gate doubles as a ladder, so he can unload the barrels and sacks. We are honest, trustworthy and fair. 30 PCS of real tree armatures, random sizes. Fits perfectly in almost ALL HO, OO, O, TT, Nscales! Realistic to the eyes, realistic to the touch! Due to it's natural origin, these plants are simply the Best looking miniature trees available! All you have to do is cut to the size you want. There is endless possibilities that you can create with these and even cut them to different sizes to fit your needs to build your own custom building/site. Classification: HO Scale Vehicles. Handles Trailer and Container Loading or Unloading. Add-on Spreader Bar for Container Loading. Train Sets Only will help you resolve issues with the manufacturer when necessary. • New Underbody & Wheel Decoration for Improved Realism. Category: Vehicles. Item Number: 949-2207. Woodland Scenics PF5188 HO Pre-Fab D's Diner Structure Building Kit. This is the HO Scale D's Diner. One HO scale D's Diner Pre-Fab Building Kit. Pre-Fab Building Kit by Woodland Scenics®. Scale: HO 1/87. Manufacturer: Chooch. Tunnel Portal. Single Cut Stone. Item #CCH-8340. 4-1/4" Wide. Long sledge: 12mm x 3mm. short sledge: 10mm x 3mm. of Random sized and coloured HO scale Snowman. snowman height: from 10mm to 15mm (random). the snowman's material has an exceptionally snow-like glitter. Classification: HO Scale Vehicles. AutoScenes(TM) Ready to Detail any HO Layout. Train Sets Only will help you resolve issues with the manufacturer when necessary. Product Defects - Product does not work upon receipt. Perfect for Model Train Scenery. Reference HO Scale 1:86. Limited Edition. Perfect for Model Train Scenery. HO Scale 1:86. Reference HO Scale 1:86. Limited Edition. Walters SceneMaster 1/87 HO scale, (2) Bicentennial Chicago & North Western 40' Trailers, SceneMaster #949-2316, nicely detailed, made from quality plastic, 2 trailers with different numbers. Nicely detailed 1/87 HO scale model for an HO layout, or as a stand alone collectible model. These precision cast replicas are painstakingly finished in official colors. Train Sets Only will help you resolve issues with the manufacturer when necessary. Product Info Product Defects - Product does not work upon receipt. By Woodland Scenics. Materials for scenery - 3 trees and foliage. HO Scale 1:87. "The Hunter". Highly detailed pewter castings for old pickup, hunter, bird dogs and camping gear. SHARP TRUCK NEW FOR 1954 NYC LETTERING IS SMALL SO EASY CHANGE. Fits Walthers Mainline 75' and 53' GSC Piggyback Flat Cars. Checking Out! Train Sets Only will help you resolve issues with the manufacturer when necessary. 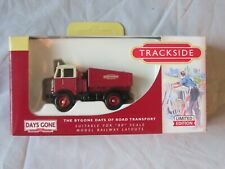 Train Sets Only Item Number: 949-2405. Product Defects - Product does not work upon receipt. All Chooch Enterprises scenery products are handcast resin, prepainted and weathered. New in the box direct from the factory. I am an authorized dealer. Can be cut with razor saws, and shaped with files. Fits perfectly in HO, OO,or 1:87-1:72 model scales. and tiny stuff may vary! Fully built, and painted set ! Realistic to the eyes, realistic to the touch! These higly detailed parts are ready to be an enchanting. 120 pcs of mini boxes, barrels & tyres ! Fits perfectly in HO, OO, TT, N model scales. The pictures show the exact set you'll get. a few extra! ~~~~~~~~~~~~~~~~~~~~~~~~~~~~~~~~~~~~~~~~~~~~~~~~~~~~~~~~~~~ ~~~~ ~~ ~~~~. Terrific loads for Walthers Mainline 75' & 53' GSC Piggyback Flatcars. 2nds marked with this condition will have a maximum of (1) defect, and they will be that of a very mild issue. These defects could include, but are not limited to: wavy roofwalk, loose weight, printing typo, broken grab iron, broken air hose, etc. Will operate on 14-16 Volts. How it started; I have been interested in model trains since I was a child. It was more fun and much cheaper, now I can fix most locos so they run like new. Rest of World Orders Over £50.00 £29.20. 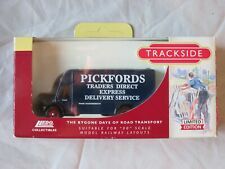 Used model railways & collections always wanted.